Ensuring that legally residing non-European Union nationals, referred to as third-country nationals (TCNs), are treated fairly and in a non-discriminatory manner is the goal of the EU’s efforts to build a comprehensive EU immigration policy. Accordingly, the EU has adopted secondary legislation covering different categories of TCNs and various stages of the migration process. The European Parliament has furthermore highlighted the need for a comprehensive labour migration policy for TCNs, and for better integration of TCN migrants to meet the European Union’s objectives for smart, sustainable and inclusive growth, as well as to fill gaps identified in the EU labour market – which lead to loss of individual income and tax revenue. This cost of non-Europe report however identifies a number of gaps and barriers. These result from the lack of incorporation and implementation of international and EU human rights and labour standards, and the sectoral approach taken in the EU legal framework, which does not cover all TCNs and not in the same way, and in part leaves parallel national schemes in place. The report particularly highlights a number of obstacles TCNs face, including regarding equal treatment, entry and re-entry conditions, work authorisation, residence status, intra-EU mobility, social security coordination, family reunification and the recognition of qualifications. Visit the European Parliament homepage on migration in Europe. This cost of non-Europe report draws a distinction between impacts at the individual level, due to an inadequate protection of fundamental rights and freedoms, and economic impacts upon Member States and the EU. 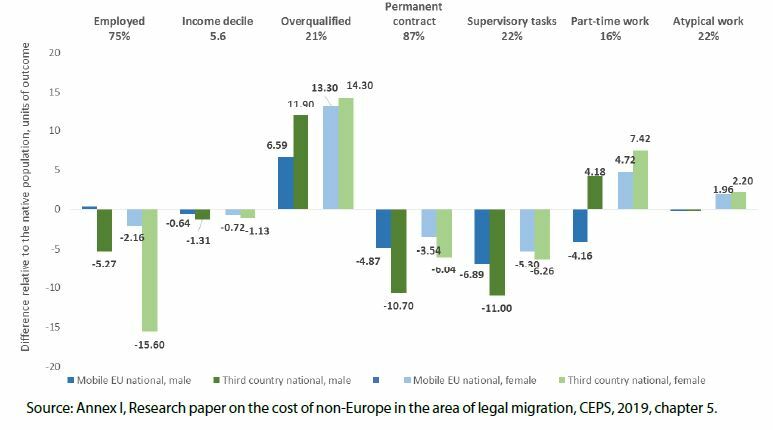 Beyond giving rise to discrimination, the gaps and barriers in EU action and cooperation in the area of legal migration result in income losses at individual level and lost tax revenue at societal (aggregate EU) level. The greatest impacts are due to unequal treatment with regard to access to employment, employment conditions including remuneration, and the barriers imposed on family migrants. At societal level, these deficiencies undermine the EU’s ability to attract workers, and especially to address shortages in particular sectors or occupations in the EU labour market, as well as the effects of demographic change (an ageing population), and to boost innovation and growth. These deficiencies all negatively impact GDP growth. It is, however, very difficult to estimate a monetised benefit of the EU attracting further TCNs. This is due to the many factors to take into account, especially when making longer-term predictions. revisit the idea of adopting a binding immigration code covering all TCNs. Depending on the policy option pursued, some €21.75 billion in individual and economic benefits could be achieved each year. Read this study on ‘The Cost of Non-Europe in the area of legal migration‘ on the Think Tank pages of the European Parliament. The European Parliament's European Added Value Unit provides European Added Value Assessments and Cost of Non-Europe Reports which analyze policy areas where common action at EU level is absent but could bring greater efficiency and a public good for European citizens.